(Nanowerk Spotlight) Nanomedicine, especially drug delivery with nano-sized drug carriers, is all the rage these days. The concept sounds simple: make nanoscale containers that can escape detection by the body's defense mechanisms, fill them with a drug, get them to the desired location within the body, release the drug payload and, presto, you've got a very effective and efficient weapon for instance to fight cancer. That this model works in principle has already been demonstrated in numerous studies. The same studies show the complicated nature and the many difficulties that scientists are facing in fabricating the right nanocontainers, getting them to the right location, controlling the release mechanism of the drug, measuring the drugs' efficacy, and monitoring the now empty delivery vehicles' fate. In a previous Spotlight – Mathematical engines of nanomedicine – we described the vast complexities in designing effective nanoparticles that take into account a wide range of possible design parameters (such as size, shape, surface properties, bulk properties, surface density of targeting moieties) and the biological characteristics of the cellular target in the body (such as receptor density, blood-flow descriptors, wall permeability). The findings we described in this article also indicate that almost all the nanocarriers that are in the clinic or in the preclinical pipeline today are basically the worst possible size and shape for their intended purpose. That engineered nanomaterials, especially inorganic ones, will be used for nanomedicine applications has now become a certainty. However, the use of these nanomaterials should occur with detailed knowledge of delivery, fate and functioning at the target, and finally release from the body. And that's an area where a lot of unanswered questions remain. In particular, the question of what happens if (and that still often is a big if) the drug-containing nanoparticles reach their intended target is a crucial one: How do the drug molecules get released from the delivery vehicle? In other words, how does the 'envelope' get opened? What is the fate of the nanoparticles (drugs as well as containers) post opening? New work done by scientists in India is contributing to how the nanoscience community is tackling these issues. "We have shown that the release of nanoparticles encapsulated in biofriendly starch by specific enzymes can serve as a prototype model for studying the digestion of biofunctionalized nanoparticles and may open newer research avenues where the stabilization and release of nanoparticles could be achieved using well-known therapeutic biomolecules," Dr. Arun Chattopadhyay tells Nanowerk. Chattopadhyay, a professor in the Department of Chemistry at the Indian Institute of Technology Guwahati, together with his colleagues, has published his findings in the August 20, 2008 online edition of Langmuir ("Probing Au Nanoparticle Uptake by Enzyme Following the Digestion of a Starch-Au-Nanoparticle Composite"). In this paper, the IIT team reports the results of studies on the enzymatic release of gold nanoparticles encapsulated in starch. 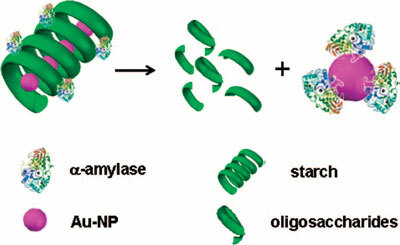 "In particular, we observed that the digestion of a gold nanoparticles-starch composite by α-amylase not only led to the degradation of starch into its lower analogues but also resulted in the release of encapsulated gold nanoparticles and their subsequent uptake by the enzyme" Chattopadhyay explains. "In addition to conventional biochemical and microscopy probes, the surface plasmon resonance (SPR) of gold nanoparticles provided a convenient way of following the reaction and establishing the mechanism. Our observations indicated that the rate of digestion of the starch-gold nanoparticles composite by alpha amylase was similar to that of pure starch and the free thiol groups of the enzyme possibly facilitated the uptake of gold nanoparticles by the enzyme in comparison to other carbohydrate-degrading enzymes such as amyloglucosidase." These results could be particularly useful for nanoscale drug delivery and imaging studies in vitro. For example, if one wants to screen microorganisms that produce alpha amylase this method would allow a quick and easy way of doing that: the test of the presence of alpha amylase (produced by microorganisms) could be done by the starch-gold nanoparticle composite, which subsequently would release the nanoparticles (catalyzed by the enzyme). Of course, details of the concentrations of the composite etc. would still need to be worked out. Chattopadhyay gives another example: "If one is interested in screening alpha amylase inhibitors then similar method could be used for that purpose. Alpha amylase inhibitors are known in plants to play important roles in rendering pest resistance attributes to the plants. Hence, there is a tremendous interest in developing transgenic plants bearing such inhibitors. The screening of the inhibitors produced by the plant (or the functional assay of the inhibitors) could be done based on the present method., i.e. measuring the change in localized SPR of gold nanoparticles." The IIT scientists are currently working on two major areas in the nanomedicine field – fundamental understanding of phenomena related to the development of nanomaterial based diagnostics and therapeutics. "While conventional diagnostics take either a long time to complete, may involve cumbersome steps, are too expensive to be affordable for a large section of the population, or exhibit low efficiency or sensitivity, the use of nanomaterials could be of great help in overcoming those disadvantages" says Chattopadhyay. "The question is: can one address these downsides systematically, with a reasonably good understanding of the science part of the process? We would like to do that systematically at least in some of the cases." He mentions that he and his IIT colleagues are also working on the development of nanomaterials-based therapeutics. "For example, we have recently shown that use of silver nanoparticles in conjunction with gene therapy may be a better option for anti-cancer therapy than the use of either of them ("Implications of silver nanoparticle induced cell apoptosis for in vitro gene therapy"). We are currently working on the use of composites rather that use of nanoparticles alone for similar purposes. That way the use of each component (of the composite) would be minimized, while the efficiency of the composite would be better than the isolated components at lower concentrations."